Halloween season..tricks and treats...the treats are the best! My Secret Pal has done it again. A treat arrived today in time for Halloween. That was one heck of a broom that made it here all the way from Japan! Bento box items, a special kind of green tea, Halloween pasta (guess what we'll be having for dinner!?! 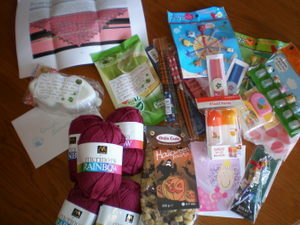 ), a Potter phone leash (very magical), 5 skeins of merino wool (yummy) and the Forest Canopy Shawl pattern. Thank you Pal for the wonderful treats!!! Perfect, simply perfect. This pair makes my third for the month AND twenty-first for the year! That's more socks than I knit last year. Ending the year at twenty-six would be nice...half of what those participating in the 52 Pair Plunge are trying to achieve. Hmmmm. But first, I should really finish the Fair Isle AND the baby sweater! Miss me? 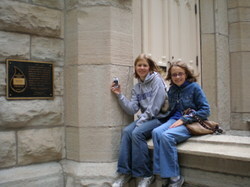 The kids had a break from school and we fled to the big city...Chicago. In particular, the kids (and the sock) went to visit the Star Wars exhibit. Out of this world! In the 22 years that Doogie and I've been married he often teases me about my ability to run into someone I know. The story remains the same even in a city of 3 million people. While Special K was busy trying to teach a robot to walk, we managed to run into our former neighbors from ten years ago! Imagine what might happen if I came to your town. Of course the exhibit wasn't the only thing Chicago had to offer. We played tourists and went to Navy Pier and walked the Magnificent Mile. There was a geocache at Water Tower Place and soon we had a pretty good idea as to why Chicago is known as the Windy City. Later, when we met up with Tom and Franklin for a late lunch, I'll admit to being slightly embarrassed when Franklin asked if I'd knit Special K's hat. How I wanted to say, "Why yes...that is one of my projects." 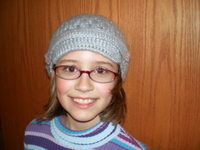 But, instead, I admitted to being the knitter who purchased acrylic knitwear for her child. These things happen when you roadtrip. 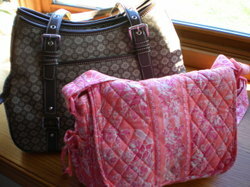 You can tell the seasons are changing...in my case, the pink purse needs to be put away till spring. Check out the new brown one that has taken its place. It's all about handbags here today. My Secret Pal sent two skeins of Noro Silk Garden. 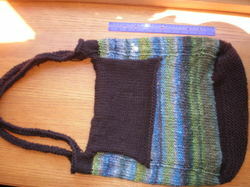 It seemed the perfect amount for a felted bag. I cobbled together 3 bag patterns and think that I'm happy with the results. We'll see if I'm still happy once it's completely dry. At least it's the right "season". 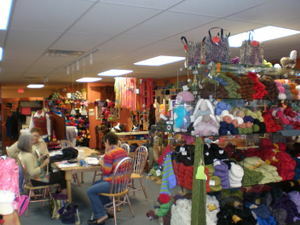 For all the recyclers, yarn from old newspapers! Just don't get caught in the rain! For a caffeine fix for the holidays, the Winter Wonderland Coffee Swap sign-ups are open. That can only mean that Caribou's Reindeer blend is right around the corner. Fa la la! 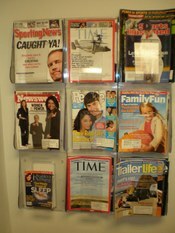 Have you noticed the increase in catalogs in your mailbox? Yes, the holiday season is approaching but, whose bright idea was it to make me feel old along the way!?! 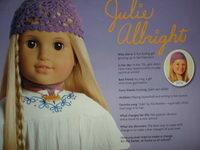 The new American Girl Doll catalog showed up in our mailbox. They've added a new character to their "historical" series. Her name is Julie; she's from the 70's. The historical 70's!!!! The glossy ad declared to my daughter that I was "historical"! Not a happy moment at Chez Krafty1!! However, much I denied their historical claim, they did manage to achieve some (personal) historical accuracy...I wanted an embroidered gauze top like hers. My Mom made one for my cousin and I was so disappointed that she didn't do one for me as well. The poster in the locker...Brady Bunch. (Nah, I was a Partridge Family devotee.) Browsing through Julie's accessories I found my old shag footprint rug and the Christmas gift I wished for, never got, and am all the better for never receiving it. The trip down memory lane was fun although distressing to be called "historical". The catalog is now history. Thank goodness for marvelous mail that doesn't make me feel "historical"!!! Every once in awhile, a girl needs a bit of immediate gratification. 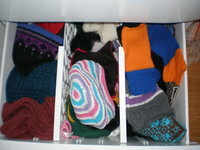 Socks, don't take quite as long as a sweater but still take longer than these. Normally, I'm not big on knitting dishcloths. But something about these Halloween goodies seemed impossible for me to resist. Maybe it was the colors. Skully was first. One skein of Sugar n' Cream yielded two green skully dishcloths. I wish that I could say the same for the orange Peaches n' Cream. I had to substitute a different orange on the bind off row in order to have enough for two Punkins. Guess that one is mine. Not real crazy about the smile on the pumpkin either. 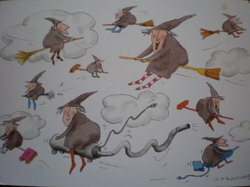 My favorite, by far, are the purple Batty dishcloths. For some reason they appeal to me completely. (And they are far more purple than the camera picks up!) Each of these took less than two hours to complete. Six dollars, six dishcloths in under twelve hours. Not bad. Other stealth knitting...a case for Special K's recorded. Her teacher asked the kids to bring in tube socks for them but since no one in the house wears tube socks and there is a lot of leftover yarn...voila! 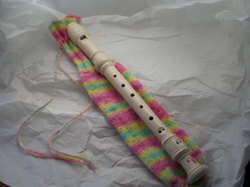 A recorder tube with braided tie closure. In 2005, Special K tie dyed some pillowcases. We used the leftovers to dye some DK Knitpicks Bare. 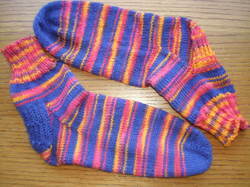 A pair of socks were made with the yarn and the leftovers have sat until this weekend. Special K is thrilled that her recorder case will be unique and made with yarn that she dyed herself. A couple of hours here and there makes a lifetime of memories. Gotta love a couple of hours. After reading all of the comments, checking to see who linked to the contest, and bookmarking a number of new (to me) blogs...the random number generator chose number 23. The winner is...Wendy. Congratulations! I've been reading Wendy's blog for awhile, but there were a number of new visitors whose blogs I'll spend some time catching up with. 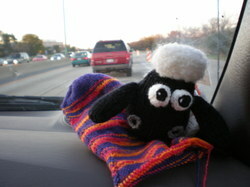 I've been a little preoccupied of late and have missed or nearly missed a number of cool happenings in the blogosphere. Mystic Waters, a mystery shawl knitalong, is something I discovered while reading Linda's blog. Registration is open until the 23rd, so you've got a couple of days left to get in. I'm looking forward to having something "extra" to work on. Thanks to everyone who left a comment. A few gave me ideas for future contests. Watch this space. These are the socks that were supposed to keep me company at the den tist office. Leftovers. 29 grams of leftover purple from Miss C's "farewell" socks. 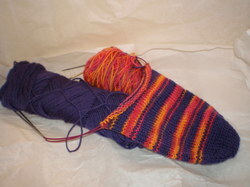 That combined with the leftover Flames is turning into the perfect pairing for Mad Cow socks. The purple combined with the reds and oranges will be perfect for Special K.
Using up these leftovers will enable me to eliminate 2 more skeins from my Ravelry stash towards my Socktober goals. Thankfully, the goals I've set for myself allow me to treat myself with new stuff from time to time. After three weeks of company and a meeting that took me "on the road", it was just the excuse I needed to make a little side-trip after the meeting. What a treat! 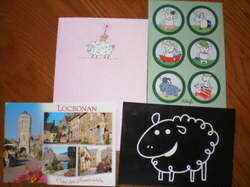 Upon entering Monterery Yarn I knew that I had a new reason to be excited about "on the road" meetings. Colleen, with her beautiful Brit accent, and Kathy (co-owners) were warm and welcoming. That spirit is reflected throughout the shop. The variety was enjoyably overwhelming (and well organized) and inlcuded plenty of "alcoves" to "lose yourself". At one point I just sat down at the table to take it all in. What a treat! Of course I didn't leave without a few goodies. Monterey Yarn carries one of my favorites, Lorna's Laces Motherlode colorway was a definite bag filler. 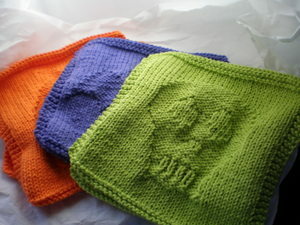 These will be knit up for a special recipient. Shhhh! 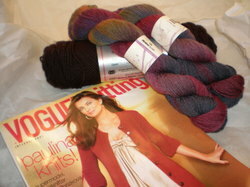 A skein of Lamb's Pride worsted (chocolate souffle colorway) will be the perfect compliment to the Noro that SP11 sent. 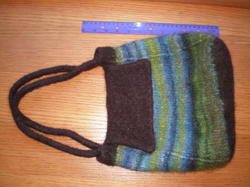 Now that the weather is changing, this combination is just the thing for making Jessica's Felted Bag for this fall. It's been so busy around here lately that I hadn't seen anything about the Holiday Issue of Vogue Knitting. (Hmmm, their link isn't working either...that might have something to do with it...) So many treats...thank goodness the weekend is here! Well, it finally happened...the unthinkable...caught waiting for a child at the dentist office without any knitting!!!!! Oh, No!!!! The horror!!!! Now, before anyone scolds me or reminds me about keeping knitting in the car...my knitting HAD BEEN in the car just 45 minutes before we left for the dentist. 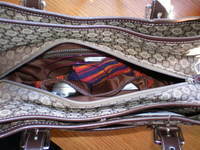 The pattern was in my purse. The problem came when I carried "my things" out of the car and dropped them on the kitchen counter (because I had a spare moment). Somehow, my knitting bag was in the mix. Oh well, thankfully, there was a comfy chair at home with my name on it and my knitting waiting for me when we returned from the dentist. Reminder: The Contest ends soon. The winner's name will be drawn on Saturday, October 20th.